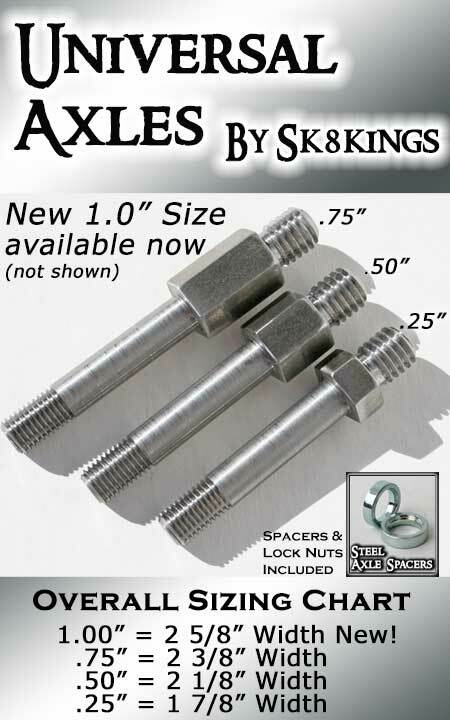 Replacement axles that fit various threaded (screw-in) axle CNC truck hangers. Very versatile 8mm axle shaft is 1 5/8" -- adding to your choice of hex shoulder dimensions outlined below. Great flexibility for quick wheel changes when you need it. Constructed from aircraft grade steel and designed to work with standard thread/size 5/16 axle lock nuts and 8mm wheel bearings. These coarse thread axles can also be compatible with 2X, Radikal, Don't Trip, 161 EttSexEtt and Splitfire trucks. Axle spacers and axle lock nuts included. Offered in 1/4" (.25") shoulder - coarse thread - overall dimension is 1 7/8" hanger to end. Sorry - no other sizes available at this time. Sold in pairs -- enough for one truck. Axle spacers and lock nuts included.